Not Satisfied When the School Removes Information from the IEP? Voice your Concern! How do I write a letter to voice my concerns about my child’s IEP? The school removed all information concerning reading and language from the IEP. How do I let them know that I am not satisfied with their findings? Present Levels are a critical part of the IEP. You need to include information about your child’s present levels of academic achievement and functional performance. Until your child’s Present Levels are accurate, you will never be able to get the program, placement, or education your child needs. Parents and advocates must learn now to design accurate and up-to-date present levels of academic achievement and functional performance. Read Present Levels: Foundation of the IEP by Indiana advocate Pat Howey. Turn to page 99 in your Law book, Wrightslaw: Special Education Law, 2nd Edition. You will see the IDEA requirements for Present Levels in all IEPs. 20 U.S.C. Section 1414 (d) (1) (A) (i). When parents fire off a letter to the school, they are usually in the middle of a crisis that involves their child. At that moment, they want to do something. They may be trying to right a wrong or protect their child from harm. Some parents write angry “last straw” letters after a series of bad experiences or incidents that occurred over a period months or years. Before you put pen to paper, you need to STOP and THINK about what you want your letter to accomplish. There is an art to writing letters that makes your point without alienating your readers. 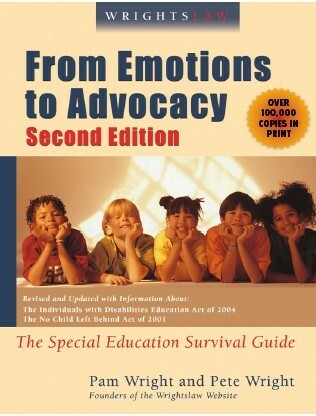 We discuss this issue in more depth in our book, From Emotions to Advocacy, 2nd Edition. If you don’t have a copy, I recommend that you pool your pennies and order a copy. It will help you avoid making costly mistakes. The FETA book also includes dozens of worksheets and forms. What’s So Important about Present Levels? This entry was posted in IDEA 2004, IEPs, Letters and tagged IEPs, Letter to the Stranger, Letter writing, Letters, Present Levels, Present levels of academic achievement and functional performance by Pam Wright. Bookmark the permalink. Please help. We just recently had my daughter’s IEP updated but when we got our copy the modifications and accommodations were not listed. When we confronted the school they responded with the teacher does not feel like making these changes for your child and we agree with her. We then confronted the teacher who got an attitude with us. She hates us for some reason. She mentioned that it is her classroom and she does what she wants to do. We requested for another IEP meeting to go over accommodations and modifications and have them put back in the IEP but the school refused saying we don;t feel like meeting with you. We are so frustrated what can we do to help our child. The school cannot unilaterally remove items from the IEP without the team meeting on it. You don’t have to sign anything. If the school does this they have to provide you with a document called a “prior written notice” that explains what they did & why. You may set up an IEP meeting to discuss & ask for evidence on how they came up with this decision (testing results, etc). IF you disagree you may request a reading & language evaluation. You must sign the school’s consent form so that they have to do the testing within 60 days. Once you get the test you have a meeting to go over. Ask for the test results ahead of time to go over with a professional as needed. If you disagree you may tell the school that in writing & request an outside evaluation at the school’s expense.